After visiting a number of Healthcare/Pharma agencies recently it has set my cogs whirring about the current application of virtual reality (VR) within medical and healthcare settings and the huge potential its ‘second coming’ presents us with. VR is certainly not new to the healthcare sector, since its introduction to medical teaching in the early ‘90s, VR has been increasingly gaining acceptance for use in medical training and treatments of psychological disorders. However now, with hugely improved technology and the rise of the Oculus Rift we are seeing a building interest in the new wave of technology and its implications for medical and healthcare provision. One of the most interesting and exciting prospects presented by this technology is the power of the rift to challenge and change perceptions. Many experiences out there have been created with the aims of exposing, training, evoking responses and unleashing new freedoms for users. A real game-changer is the ability to give medical health practitioners the chance to ‘stand in the shoes’ of their patients. Last year we saw a system released by Viscira that used the Oculus Rift to simulate the impact of schizophrenia on a patient. By donning an the Oculus Rift, a healthcare professional, care-giver or other user could become completely immersed in a 3D environment that offers a full visual and auditory experience of what it might be like to be a schizophrenic patient. The intent was for the user to develop more empathy for the patient and the various challenges they face. This in turn helps to reinforce the need for active, consistent patient support and ongoing medication adherence. The impact experiences like these could have on the future of understanding, diagnosing and treating conditions is overwhelming and feels like a breath of fresh air into the industry. Below are a few direct examples of some of the ways that the Oculus Rift is currently being used in the Medical and Healthcare arena to train, inform and treat patients and professionals alike. Unsurprisingly virtual reality continues to play an important part in training the next generation of medical professionals. The technology gives trainees freedom to gain critical experience and feedback within a safe, controlled environment without causing harm to any real-live patients. Thomas Gregory, an Orthopaedic Surgeon teaching at Paris Descartes University, recently filmed an entire hip replacement surgery in stereoscopic 3D with a 180-degree field of view. 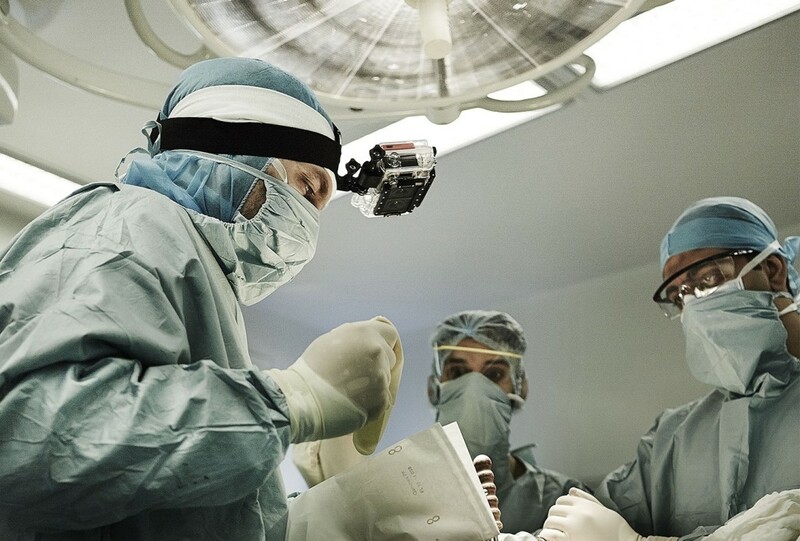 This is quite a breakthrough as once placed in the Oculus Rift the tool allows students and surgeons to get first- hand visualisation of the procedure. On 28th January 2015 we saw the release of EyeSim. EyeSim allows participants to explore structures of the eye along with supporting animations. Using a virtual patient, users can examine pupillary, ocular motility and cranial nerve dysfunction. A visual pathway simulator also enables the user to explore brain damage impacts on a patient’s vision. Although using a previous virtual reality headset, a virtual reality exhibit called “EyeMac” enabled physicians to simulate the experience of having neovascular (wet) age-related macular degeneration (AMD). Physicians used special goggles to immerse themselves in several virtual scenarios from a first-person, patient perspective. Additionally, the module generated data to help physicians better treat this eye disease. There are plenty more conditions out there that could be replicated in virtual reality, be this through the Rift or other headsets such as Samsung’s Gear VR and even the modest Google Cardboard. Through its ability to reproduce environments which may not be easily accessible in the real world, virtual reality can helpfully be used to place first- responders in the time-critical scenarios that they will likely have to deal with e.g. major motorway road traffic accidents. This technique provides a more representative environment for participants to develop the required decision making and practical skills. The realistic scenarios presented by virtual worlds can also help counter the usual complaints with training simulators, which include the lack of, or unrealistic human interaction. Nurses can be increasingly engaged in role-play training simulations with virtual patients and find that VR helps provoke more empathetic and true responses. After spending a fair few hours in some of our own demo experiences at Formation I’ve been taken aback at how seamlessly my sense-of-self altered when in virtual environments. A number of our demos use the Leap Motion or Microsoft Kinect to allow interaction with your limbs, whether this be as a pair of hairy men’s arms or even as cat’s paws! In each experience it surprising how subconsciously body language and behaviour adapts to fit the new gender/ animal persona. This same concept can be used for a variety of rehabilitation treatments. Phantom limb sufferers have reported dramatic pain reduction when using virtual reality to visualise the missing limb in its original place and come to terms with the loss. This same technology could be used to help practitioners understand what it feels/looks like to wear prosthetics or the environment could be manipulated to reflect that of a Parkinson’s or Arthritis sufferer. Recently a hospital developed a breakthrough treatment for pain management in burns patients who usually require sedation throughout their recovery. Virtual reality headsets are being used to enable the patient play videogames during their treatment as tests have shown that the patient’s pain threshold is far higher when they are distracted. Using game technology further, stroke patients undergoing rehabilitation can use virtual reality as part of their programme to aid development of motor control and motivation through small interactive tasks. This could be for example using a controller to pick up and manipulate a virtual object or walk around in a virtual environment. 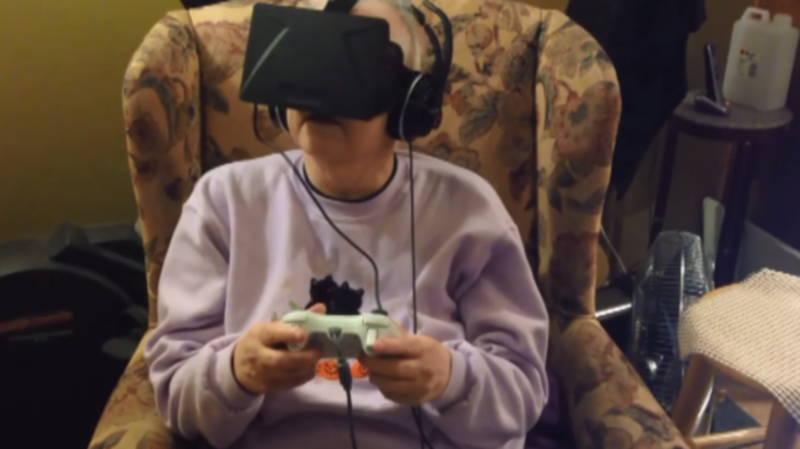 The diversity of experiences allowed by the Oculus rift is particularly powerful for those who have reached the point whereby they no longer have the strength to navigate their own home. Virtual reality can provide an opportunity to experience places and activities they had only dreamed of. A touching story is how the rift helped Roberta Firstenberg during her battle with cancer. The applications for VR in therapy are numerous with more popping up all the time. Existing therapy for phobias involves a dose of Exposure Therapy, for example introducing a live spider to someone with arachnophobia. Virtual reality exposure therapy (VRET) however has been shown to be as effective, if not more, than this ‘in vitro’ exposure. 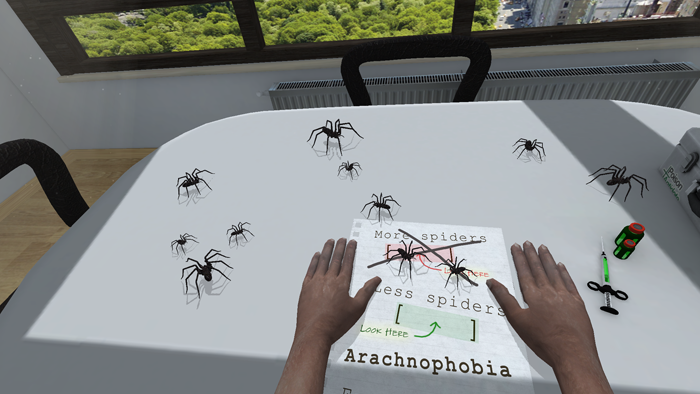 This result is down to the fact that through the Oculus Rift sufferers can be exposed to virtual spiders, small spaces, heights, public transport etc. The environment can then be fully controlled by the user, who determines whether to progress to the next level or whether to disengage from the experience. With this knowledge, sufferers are more likely to try the experience, the environment and conditions can also be tailored to each case. A great example of this technology is the Anxiety Management Virtual Reality (AMVR) system by Phobos. Virtual Therapy can also help with overcoming addiction. Designed to expose patients to scenarios tailored to their addiction, be this drug use, alcohol or smoking, patients are taught to cope in these environments and reinforce new, positive forms of behaviour. This same approach is used in PTSD treatment. ‘Virtual Iraq’ is a system developed for soldiers returning from the war whereby the soldier is shown scenes from their tour of duty. The idea is that they increasingly become accustomed to seeing these images and learn to confront their fears. The result is the lessening of the symptoms of their disorder over time until it eventually disappears. In the treatment of disorders such as depression and anxiety an interesting approach of, ‘self-to-self therapy’ has been introduced. This approach uses avatars with the patient encouraged to show empathy towards a virtual crying child. The patient is then arranged so that they are embodied in the virtual child and experience their own compassionate words and expressions delivered back to them. 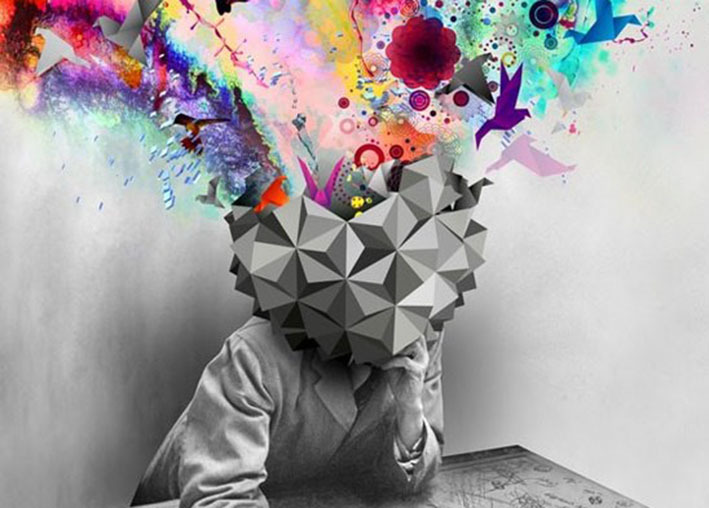 It has been suggested that through these techniques immersive reality can be utilised to introduce patients to indoctrinate positive emotions which are crucial for mental health and help to decrease negative emotions. So there we have it, a round-the-houses roundup of just some of the ways virtual reality is being used in medical and healthcare settings. What is really exciting to see is how virtual technology, together with the Oculus Rift, is not only being narrowly used as a gaming device but is being proven to have far wider-reaching societal benefits whether this be for education or health treatments. We are currently only scratching the surface of the applications for virtual reality in the healthcare setting. However with such a rapid rate of progress it looks like it won’t be long before we shall see a shift away from traditional methods and towards the future where perceptions are challenged and patients’ needs better understood and met.